Jesper Thomsen is a heavy hitter in the B2B world. Since finishing his business degree and starting at Maersk in 1994, he’s been around sales, marketing, HR and customer service. 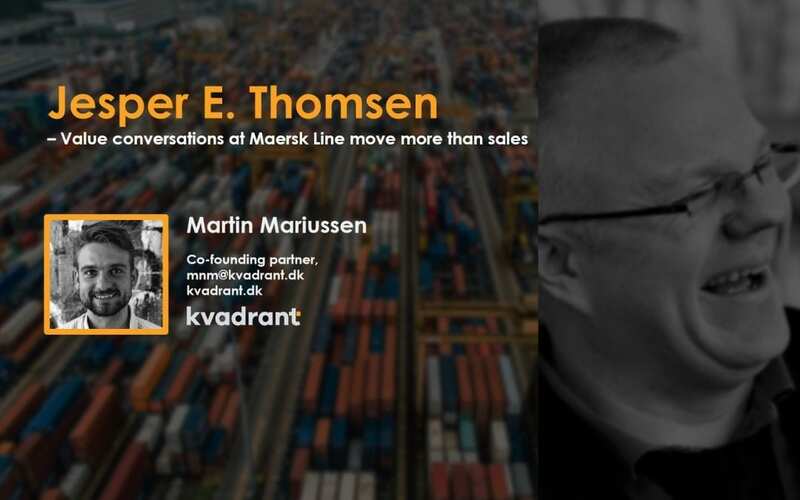 As Maersk Line VP of Customer Service and Sales 2012-2014, the largest container shipping company in the world, he headed the transformation of more than 10.000 people across the globe. One of these projects (CTWWS) was about changing the way sales is typically done in the container shipping industry. Moving from talking price and transit times with the customer to value and differentiators. Moving from the idea that sales is an art, to the understanding that it’s about consistently doing the right things, in the right way at the right time. Kvadrant sat down with him to learn more about his lessons learned from large scale sales development projects, his perspective on current commercial challenges in B2B and what musicians have in common with modern marketers. On the subject of large scale-transformations, what was purpose of launching the CTWWS?